His Excellency Dr. Hassan Rouhani, President of the Islamic Republic of Iran, paid his first State Visit to India at the invitation of Prime Minister of the Republic of India, Narendra Modi, from 15-17 February 2018. During the visit, Dr Hassan Rouhani, President of theIslamic Republic of Iran was accompanied by a high-level delegation comprising Cabinet Ministers, senior officials and business leaders. He was accorded a friendly and cordial ceremonial welcome in the forecourt of RashtrapatiBhawan on 17 February. President, Shri Ram NathKovind hosted an official banquet dinner in honour of the visiting dignitary. Delegation level discussions were held between Prime Minister Shri Narendra Modi and President Dr Hassan Rouhani. Prime Minister of India also hosted a Lunch in his honour.Hon'ble Vice President and External Affairs Minister of India called on the visiting dignitary. President Rouhani visited Hyderabad on 15-16 February 2018. Wide-ranging and constructive discussions on bilateral, regional and multilateral issues were held in a cordial atmosphere. In recalling the principles on development of bilateral relations articulated in the ‘New Delhi Declaration’ of 23 January 2003, the two sides expressed satisfaction at the progress made in bilateral ties since Prime Minister Modi’s visit to Iran in May 2016 and reiterated their common resolve to further intensify and strengthen multifaceted bilateral cooperation. The two leaders noted that the mutually beneficial ties between the two countries were based upon the strong foundations of the two millenia old cultural and civilisational connect. They shared the view that strengthened bilateral relations also contribute to regional cooperation, peace, prosperity and stability. President Rouhani and Prime Minister Modi agreed to further intensify and diversify the existing high-level engagement through frequent and wider range of bilateral exchanges at all levels. In this context, it was decided to convene within this year the meeting of the India-Iran Joint Commission and all its Working Groups, Foreign Office Consultations, dialogue between defense and National Security Council structures of the two countries, Policy Planning dialogue, and topromote Parliamentary exchanges. 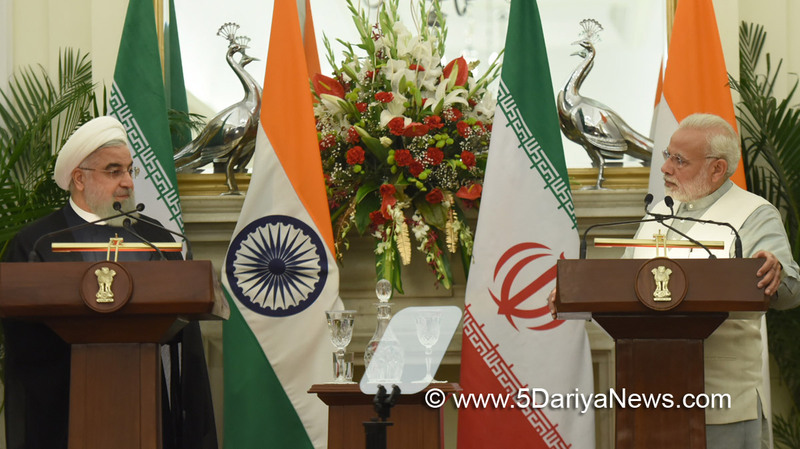 The two sides recognized the unique role of Iran and India in promoting multi-modal connectivity within and across the region. The successful inauguration of the Phase-1 of Chabahar Port in early December 2017; the ratification of the Trilateral Agreement between India, Iran and Afghanistan on Establishment of International Transport and Transit Corridor by all sides; and the successful shipment of wheat assistance from India to Afghanistan through Chabahar Port have opened a new gateway to and from Afghanistan, Central Asia and beyond. Both sides reiterated their commitment for early and full operationalisation of ShahidBeheshti Port at Chabahar. The Iranian side welcomed the investment of Indian side in setting up plants in sectors such as fertilizers, petrochemicals and metallurgy in Chabahar FTZ on terms mutually beneficial to the concerned parties. In this context, both leaders welcomed the lease contract for ShahidBeheshti port of Chabahar during interim period between port and Maritime Organization (PMO), Iran and India Ports Global Limited (IPGL). They further directed that the Coordination Council should meet within the timelines stipulated in the Trilateral Agreement. With a view to fully utilize the potential of the Chabahar Port and its connectivity to Afghanistan and Central Asia, India conveyed its readiness to support the development of Chabahar- Zahedan Rail line. IRCON, India and CDTIC, Iran who are engaged in discussions, were tasked to finalise the technical parameters and financing options for the project in a time bound manner. Both leaders encouraged greater efforts for cooperation in railway sector including supply of steel rails, turnouts and locomotives. Both sides reiterated their commitment to International North- South Transport Corridor (INSTC) and stressed on the need for inclusion of Chabahar within its framework. It was noted that Iran will hold an early meeting of the INSTC Coordination Meeting in Tehran. India's accession to TIR Convention and Ashgabat Agreement was welcomed as additional steps at enhancing regional connectivity and linking regional centers of economic growth. The two Leaders released a joint postage stamp depicting Deendayal Port, Kandla and ShahidBeheshti Terminal, Chabahar that reflected the enhanced prosperity through greater connectivity. The Iranian side expressed its readiness to enhance enabling environment to attract Indian private/public sector investments, in Chabahar FTZ. In this context, Iran will organise a business promotion event, with participation of countries from the region and beyond, with the objective of showcasing the economic opportunities offered by the Chabahar Port. Noting the complimentarity of interests and natural partnership in the energy sector, it was agreed to move beyond traditional buyer-seller relationship and develop it into a long term strategic partnership, both sides agreed to continue and increase the pace of negotiation for reaching appropriate results on energy cooperation, including Farzad B gas field. The two Leaders agreed on the deepening trade and investment cooperation between the two countries. In this context, they recognised the need to put in place an effective banking channel for business transactions. It was noted that permission for the Iranian Pasargadbank to open a branch in India was under advance consideration. It was also agreed to set up a Joint Committee of officials to examine feasible options, including Rupee-Rial Arrangement, Asian Clearing Union mechanism to establish functional payment channels.The finalisation of the Double Taxation Avoidance Agreement was welcomed as a step that would promote business environment. The two sides agreed to undertake text based negotiations on Preferential Trade Agreement as well as conclusion of Bilateral Investment Treaty in a fixed time frame.Noting the importance of the role of businessmen and industry in promoting economic and commercial cooperation, the two Leaders welcomed the opening of the Confederation of the Indian Industry (CII) regional office in Tehran last year and the agreements for mutual cooperation signed between various trade bodies on both sides. The Indian side conveyed that it looks forward to Iran Chamber of Commerce & Industry opening an office in India. India fully supports the accession of the Islamic Republic of Iran to the World Trade Organization and the ongoing consensus building efforts among WTO members to reactivate the accession process, consistent with the objective of making the Organization universal and inclusive. Promotion of Friendly exchanges and people to people contactsIn order to facilitate friendly exchanges between the two countries, it was agreed that India would grant e-visa facility for the Iranian nationals and Iran would grant e-visa facility to the Indian nationals. The signing of visa waiver agreement for holders of diplomatic passports was also a step in this direction. Both sides reiterated the importance of addressing humanitarian issues concerning the nationals of the two countries. Iran side will positively consider India’s request to upgrade Consulates in Iran.With a view to build on the strong foundations of civilization and cultural connect and promote better understanding of each other at various levels, it was agreed to hold the Festival of India in Iran in 2018/19; establish a Chair of Indian studies in Tehran University; organise Indology courses for Iranian diplomats by the Foreign Service Institute of India; support the Persian language courses in India; cooperate further in the areas of archaeology, museums, archives and libraries. The two Leaders welcomed the growing interaction between their National Security Councils and agreed to enhance regular and institutionalized consultations between them and others concerned on terrorism, security and related issues such as organised crime, money-laundering, drug trafficking and cyber crime.Both sides expressed interest in enhancing cooperation possibilities in maritime domain. It was agreed to hold dialogue to look into measures for cooperation in defence sphere, including port calls by naval ships, training and regular exchanges of defence delegations. The two sides positively noted the progress achieved in implementation of the bilateral agreement on transfer of sentenced persons; the Extradition Treaty by both sides and understanding reached on Mutual Legal Assistance Treaty on Civil and Commercial Matters. They also welcomed bilateral cooperation as per mutual interest and agreement in a number of other areas, including higher education, science and technology, agriculture, labour and entrepreneurship, tourism, posts through regular interaction and institutional mechanisms, and directed relevant authorities to work out further details. The two Leaders exchanged views on regional and international situation. In view of strengthening multilateralism, President Rouhani acknowledges the aspiration of India to play a greater role in international fora. The two leaders reiterated the importance of strong United Nations and emphasized the need for an early reform of the Security Council reflective of the current geopolitical realities. They reaffirmed their commitment to supporting the Intergovernmental Negotiations [IGN] for comprehensive reform of the Security Council.Both Leaders underscored the need for strengthening and reform of multilateral financial institutions and enhancing the voice and participation of developing countries in international economic decision-making.Recognizing the challenges of terrorism and ideologies of violent extremism, the two Leaders reiterated their strong commitment to combat terrorism in all its forms and manifestations, and stressed that there can be no justification whatsoever for any act of terrorism. They expressed their conviction that the fight against terrorism should not only seek to disrupt and eliminate terrorists, terrorist organizations and networks, but should also identify and address conditions conducive to terrorism as well as extremist ideologies. They stressed that terrorism cannot and should not be associated with any religion, nationality or ethnic group. They urged an immediate end to all support and sanctuaries enjoyed by terrorist groups and individuals and were of the view that States that aid, abet and directly or indirectly support terrorism should be condemned. They called on the international community to end selective or partial approaches to combating terrorism and, in this regard, stressed the need to make every effort to reach an agreement on and conclude a comprehensive convention on international terrorism at the UNGA. Both sides endorsed UNGA consensual resolution in 2013 derived from the idea of Iran’s President "World Against Violence and Extremism”(WAVE) and called for combating terrorist elements and complete eradication of their supportive movements, financial support cut to terrorist groups in particular.The Indian side reaffirmed its support for full and effective implementation of the Joint Comprehensive Plan of Action (JCPOA), which has been endorsed by the UN Security Council and is crucial contribution to the non-proliferation framework and international peace, stability and security.Both sides stressed that the interests of peace and stability in the region are best served by a strong, united, prosperous, pluralisitic, democratic and independent Afghanistan while supporting the National Unity Government in the country. They stressed the significance of strengthening India-Iran-Afghanistan trilateral consultations and coordination, including by suitably supplementing their cooperation on Chabahar. In this context, they also called upon the countries of the region to come forward for enhancing regional connectivity and take steps to do away with the obstacles on land transit.President Rouhani expressed deep appreciation and gratitude for the gracious hospitality extended to him and his delegation during their stay in India. He extended invitation to the President and the Prime Minister of India to visit the Islamic Republic of Iran. The invitations were accepted and it was agreed to work on the dates for the visit through diplomatic channels.